Whoo-hoo – Happy, happy Friday! It has been a crazy week for me, glad things are winding down ahead of Super Bowl weekend! Gotta get a plug in for our Denver Broncos! Hope they bring home another Super Bowl win for Denver. 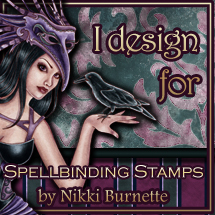 I’m tickled pink and red to be able to share with you my project for the latest challenge over at Spellbinding Stamps by Nikki Burnette. This project was a lot of fun to put together so I hope you enjoy it. Today, I’m sharing another cute fairy from Nikki’s gorgeous collection. This one is named Shelby. First off, for the project I had in mind, I needed Shelby to be facing the opposite direction. Normally she faces the other way. Easy fix with most photo editing programs is to just flip the image horizontally. Since our theme is Love & Romance I pulled out every shade of pink and purple marker I had I think. I colored Shelby with my Copics. I colored her up and gave her a bit of a punk rock pink and black hair color for something different. It’s really vibrant and I love how it turned out. Once I was finished coloring her, I fussy cut her out and set her aside. I found an awesome wood plaque at my local craft store that had cut out words that read “You & Me” in the shape of a heart. I found another small wooden embellishment that said Adore. I started off by prepping my wood with two layers of White Gesso which acts as a primer to allow me to paint the wood. Once that was dry, I painted the heart a shade of Vanilla using some Craft Smart acrylic paint. It took two coats to get an even look to it. Note, I didn’t sand the wood before adding the gesso, but it might have given it a bit smoother appearance if I had. Next I primed my word “adore” with some Gesso also and then painted it with some Craft Smart Red metallic paint. I had to use 3 coats to get an even coverage. Once it was dry, I liked the look of the metallic paint, but it didn’t have enough shimmer so I added some clear Wink of Stella to it. I allowed everything to dry overnight. The next day I was able to glue my Shelby image in place onto the heart so it appears that she’s perched on it. I used some wood glue on the Adore and glued it on the opposite site of Shelby and then I added a little foam glitter heart in red and some polka-dot gems for a little bling. This is going to make such a cute sign to hang up for Valentines Day! I’m excited to see what fun projects you can come up with for our latest Challenge over at Spellbinding Stamps. Be sure to check out the other Design Team members inspiration for this weeks challenge here. Then be sure to hop on over too the Etsy store to get some of Nikki’s fabulous images to play with for this challenge. Be sure to share your amazing creations in our Facebook Group. Hope you have a fantastic weekend! Do something crafty and make someone smile! Just darlin’… Shelby looks like she is ready when someone comes along to adore her…. and I know my granddaughter would definitely adore her and your adorable creation Tonya. Thanks bunches for sharing. j.